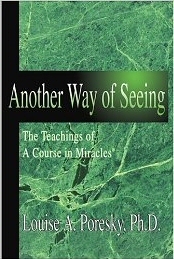 Another Way of Seeing: The Teachings of A Course in Miracles, by Louise A. Poresky, Ph. D. New York: Universe, Inc., 2005. During my 73 years thus far upon this earth, no study has been more of a challenge, relief, and support to me than A Course in Miracles. Another Way of Seeing, which explains Course principles, is astonishing in its clarity. Working with difficult metaphysical concepts that turn upside down the world as we have imagined it, Dr. Poresky states those concepts simply and concisely, illustrating their meaning by reference to well-known literary plots and characters. Repeatedly, she calls out of the immense text of ACIM the perfect quotation to drive home the principle she has been discussing. Having studied the Course for 30 years, I gained a stronger "feel" for its truth from Another Way of Seeing, yet I would also recommend the book to anyone who is just beginning their study. Although I believe the Course to have been dictated to Helen Schucman by a discarnate Voice, just as Schucman said (not written by herself based on her dreams, as Poresky claims), nevertheless I rejoice in Dr. Poresky's mostly accurate, high definition focus on the liberating teachings of A Course in Miracles.